The Enduring Ice project is a spotlight on the Arctic Ocean and the natural systems that keep the Earth cool. An inventive fusion of film and interactive media, the project explores the connections between distant polar seas and prevailing shifts in global climate. Its goal is to spark curiosity and engagement by providing learning experiences that can tug at human emotions. The project’s underlying premise is that a natural system is more likely to be valued (and ultimately protected) if we can visualize it as relevant to our everyday lives. From its vantage point in the northernmost Arctic, Enduring Ice shows us the way ocean and atmosphere work together, and then brings those interactions into meaningful focus. The feature film component, the documentary albedo, provides the entryway to discovery and insight. 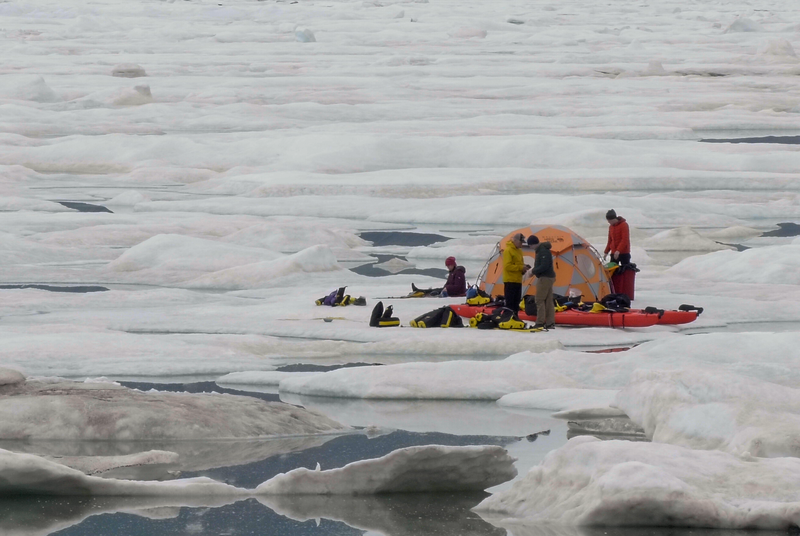 Drawing upon the day-to-day events taking place on a scientific expedition – where a team of explorers is beset by a jumble of sea ice – albedo offers audiences unique exposure to hands-on field science and know-how from empirical learning. Like the Mars rover relaying its first images back to earth, the Enduring Ice expedition opens a window to the otherworldly and fantastical Arctic. Supporting the film interactively is the project’s digital media initiative. The Enduring Ice digital media component is designed to build upon concepts introduced in the feature film. Beyond advancing an in-depth awareness of how natural systems work, this component takes audience engagement to the next level, presenting achievable goals that will move society towards restoration of those systems. By computing the positive real-world outcomes of forward-thinking environmental actions, this digital extension of the project champions opportunity-centered visions for change. The Enduring Ice project is informed and guided by new study findings that reveal the pitfalls and inadequacies of today’s environmental journalism. Its experimental approach applies insights from viral marketing research and discoveries in behavioural science. The project is inspired by the philosophy that it’s possible to think like a scientist without actually being a scientist.